Background: The impact of prosthesis-patient mismatch (PPM) on early and late outcomes after aortic valve replacement (AVR) remains controversial. In this study, we aimed to investigate the patient and surgery-related factors leading to various severities of PPM following AVR. Methods: Ninety-six patients who had undergone AVR with a prosthetic valve between 2001 and 2013 and later found to have PPM were enrolled. PPM was defined as the indexed effective orifice area (iEOA) of the aortic prosthesis to be ≤0.8 cm2/m2. PPM was considered to be of moderate or severe degrees if the iEOA was between 0.66 and 0.85 cm2/m2 or ≤0.65 cm2/m2, respectively. Results: The mean age of patients was 26 ± 15 years, and 51% of patients were female. 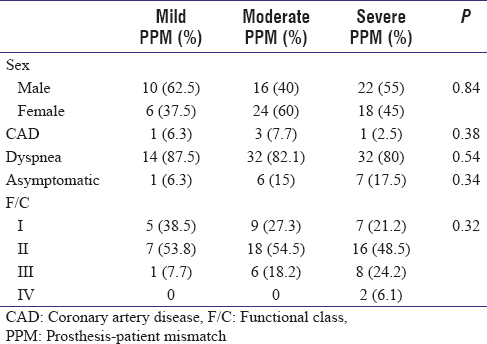 Sixteen patients (15.2%) had mild PPM, 40 patients (38.1%) had moderate PPM, and 40 patients (38.1%) had severe PPM. The majority of our patients had surgery due to congenital causes. 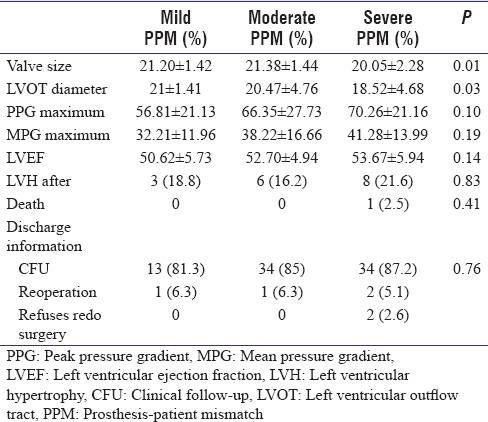 Prosthetic valve size and preoperative left ventricular outflow tract diameter were factors statistically related to PPM in the three groups (P < 0.05). There was only one death that was in severe PPM group due to severe heart failure. Conclusion: PPM is a substantial yet underrated clinical entity in patients undergoing prosthetic valve replacement surgery. Patients with smaller body surface areas, surgery at earlier age, and underlying congenital heart disease are more commonly prone to the development of PPM. As our center is referral for the patients affected with congenital aortic valve disease, mindful scheduling and performance of the aortic valve replacement surgery in this patient population is highly recommended. Prosthesis-patient mismatch (PPM) after aortic valve replacement (AVR) occurs when the prosthetic valve is functioning normally, but the effective orifice area (EOA) of the prosthesis is discrepantly small in relation to patient's body surface area (BSA). In this setting, the left ventricle has to produce a greater pressure to overcome the mechanical resistance encountered with resultant higher transvalvular pressure gradients., PPM is detected not so infrequently after AVR and is diagnosed based on increased prosthetic gradients and decreased EOA in the presence of normal leaflet motion and structure. Theoretically, PPM has been suggested to occur by mechanisms. First: Baseline reductions in size of aortic annulus due to congenital pathologies, extensive annular calcification, and fibrosis and left ventricular hypertrophy. Second: Anatomical status of the inserted prosthesis that could create a relative flow obstruction. The generally accepted value for diagnosis of PPM is an indexed EOA (iEOA) of ≤0.85 cm2/m2 which is the cutoff point when there is an increased measured gradient. In severe PPM, the iEOA is ≤0.65 cm2/m2. As PPM has been suggested to increase morbidity and mortality based on severity, it is of paramount importance to recognize the risk factors leading to PPM and implement preventive measures to avert or reduce PPM after AVR. Recent advances in the field of percutaneous AVR particularly in high-risk patients with severely stenotic and calcified valves are also bring PPM to further clinical light.,, In the present article, we aimed to assess existing data in our center and review recent growing body of evidence concerning PPM. Clinical and echocardiographic data of patients who had undergone surgical AVR between 2001 and 2013 were reviewed and 96 patients who fulfilled the criteria for PPM were selected. Data regarding age at time of first surgery, underlying disease resulting in valve replacement, clinical history, and related medical conditions were recorded. Echocardiographic variables including left ventricular outflow tract (LVOT) diameters before valve replacement, valvular gradients before and after surgery, presence of left ventricular hypertrophy, and left ventricular ejection fraction were reviewed. Surgery-related data including prosthesis size, EOA, concomitant surgeries, and the mortality rate were also recorded. The EOA was calculated as the LVOT cross-sectional area multiplied by LVOT velocity time integral divided by the aortic jet velocity time integral. iEOA was calculated by dividing EOA to patient's body surface area (BSA). Significant PPM was defined as the iEOA of the aortic prosthesis to be ≤0.8 cm2/m2. PPM was considered to be of moderate or severe degrees if the iEOA was between 0.66 and 0.85 cm2/m2 or ≤0.65 cm2/m2, respectively. Mild PPM was defined when iEOA was about 0.8 cm2/m2. The first accessible postsurgical echocardiogram-containing data regarding iEOA were used to evaluate for PPM. Follow-up data were obtained from the patient records and outpatient clinic forms. Mean value, standard deviation, and frequency were used as descriptive analysis. For evaluation, the distribution of data one-sample Kolmogorov–Smirnov test was used. Qualitative data were compared with Chi-square test. Mean values were compared using independent-samples t-test or Mann–Whitney U-test. Logistic regression was used to identify multivariate independent predictors of PPM. Odds ratios were reported with 95% confidence intervals. Multivariate analysis was done using STATA version 11 (StataCorp. LLC, Texas, USA). Most of our patients were relatively young with the mean age of patients being 26 ± 15 years at time of first surgery [Table 1]. Thirty-nine patients had undergone at least two times of surgery. All the participants had mechanical prosthesis. Mild PPM was present in 16 patients (15.2%), moderate PPM in 40 patients (38.1%), and severe PPM in the remaining 40 patients (38.1%). The comparisons between three groups in terms of demographic and clinical symptoms are shown in [Table 2]. There was a significant relationship between age at first operation and presence of PPM (P = 0.034). However, no significant relationship was found between age at first operation and each subgroup of PPM perhaps due to relatively smaller number in each subgroup. Forty-nine of patients (51%) were female. No statistically significant relationship between gender and presence of mismatch was found. Regarding the functional capacity, most reported to be in New York Heart Association Functional Classification II, but the differences between groups regarding to clinical symptoms were not statistically significant (P > 0.05). Interestingly, eighty-two of our patients with mismatch (85%) had a history of AVR due to a form of congenital heart disease (mainly congenital aortic stenosis, bicuspid aortic valve, and subvalvular aortic stenosis). Other underlying causes of AVR were rheumatic heart disease (9.5%) or aortic regurgitation (5.5%) due to endocarditis or miscellaneous causes. The comparisons between three groups in terms of echocardiographic and surgery-related data are demonstrated in [Table 3]. 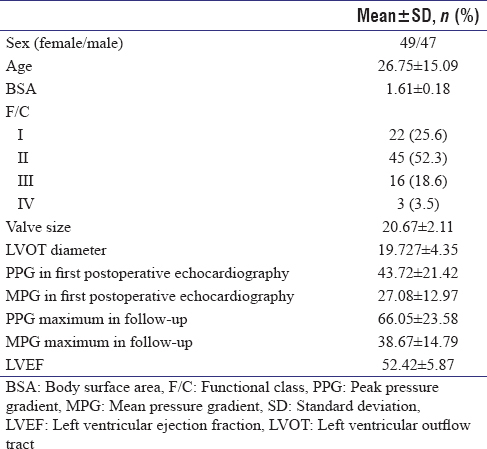 As shown in [Table 3], chosen prosthetic valve size and patient's LVOT diameter had a statistically significant relationship with the presence of mismatch in the three groups (P < 0.05). The mean LVOT diameter in affected patients was 19.7 mm and LVOT diameter before surgery had a significant relationship with the presence and severity of mismatch (P = 0.034). There were no significant differences between groups in regard to other surgery-related variables. The mean left ventricular ejection fraction in affected patients was 52.4%. The lowest reported ejection fraction was 30%. No statistically significant relation was found between mismatch and presence of other medical conditions including chronic renal disease and thyroid or liver abnormalities. In our study, 84.8% of patients were followed clinically and only 15.2% had undergone redo surgery. Two patients refused the redo operation. Mortality was reported in one patient in the severe PPM group due to advanced heart failure. The results of multivariate analysis are shown in [Table 4]. This model was adjusted for factors that were significant in univariate analysis and also age at first operation as an important predictor of PPM. Age at first operation and LVOT diameter were two predictors of PPM at multivariate analysis [Table 4]. The proposed risk factors are smaller aortic annulus (<20–21 mm), larger body surface area, left ventricular hypertrophy, and implantation of bioprosthetic valves (as compared to mechanical valves), older age, hypertension, renal failure, and diabetes. Some studies have shown an association between female gender and PPM because of smaller body surface area and a smaller aortic annulus in females.,,,, However, we did not find any relation between PPM severity and prevalence in regard to gender. We also did not find an association between BSA and severity of mismatch, similar to the study by Astudillo et al. of 311 prosthesis mismatch patients. Postoperative valvular mean gradients have been indicated to be one of important factors in PPM after valve replacement. Our patients had increased mean gradients in the first postoperative echocardiography (27.08 ± 12.97), but relation with subgroups of PPM was not significant perhaps due to relatively small sample size. The patients were all relatively young and mechanical valves were used. Coronary risk factors and other medical conditions were not prevalent and did not show significant relation to PPM severity in our study group. As our affected patients were rather in younger age group with the majority having preserved left ventricular function, early and late mortality was not clearly prevalent as the impact of PPM on mortality has been reported to relate to older age, LV dysfunction, and concurrent coronary bypass grafting. In our study, we had only one death in severe PPM. As our center is a tertiary center, patients with severe PPM would be referred for redo valve surgery as soon as clinical worsening seems to begin that might have led to decreased mortality rates. The number of affected patients in our center was matching to other studies. Our patients, however, were much younger, and congenital causes of AVR were far more common. These might be due to the point that our hospital is a referral center for congenital heart disease patients, and this important subgroup might have actually been underrated in studies performed by other centers. In summary, based on our study, we recommend meticulous measurement of LVOT diameter in patients referred for AVR. Discussion with surgical team should be contemplated in cases of LVOT/aortic annulus diameters below 21 mm. PPM is believed to lead to adverse effects on patient survival and quality of life after AVR. Every effort should be taken to minimize this risk. Greater emphasis should be put in preoperative evaluation of young patients undergoing AVR particularly those with congenital aortic abnormalities. As for older patients, with the increased performance of TAVR, further studies are needed to focus on the prevalence of PPM, and it outcomes in this subset of rather high-risk patients. Astudillo LM, Santana O, Urbandt PA, Benjo AM, Elkayam LU, Nascimento FO, et al. Clinical predictors of prosthesis-patient mismatch after aortic valve replacement for aortic stenosis. Clinics (Sao Paulo) 2012;67:55-60. Koene BM, Soliman Hamad MA, Bouma W, Mariani MA, Peels KC, van Dantzig JM, et al. Impact of prosthesis-patient mismatch on early and late mortality after aortic valve replacement. J Cardiothorac Surg 2013;8:96. Bonderman D, Graf A, Kammerlander AA, Kocher A, Laufer G, Lang IM, et al. Factors determining patient-prosthesis mismatch after aortic valve replacement – A prospective cohort study. PLoS One 2013;8:E81940. Head SJ, Mokhles MM, Osnabrugge RL, Pibarot P, Mack MJ, Takkenberg JJ, et al. The impact of prosthesis-patient mismatch on long-term survival after aortic valve replacement: A systematic review and meta-analysis of 34 observational studies comprising 27 186 patients with 133 141 patient-years. Eur Heart J 2012;33:1518-29. Dahou A, Mahjoub H, Pibarot P. Prosthesis-patient mismatch after aortic valve replacement. Curr Treat Options Cardiovasc Med 2016;18:67. Popma JJ, Khabbaz K. Prosthesis-patient mismatch after “high-risk” aortic valve replacement. J Am Coll Cardiol 2014;64:1335-8. Pibarot P, Weissman NJ, Stewart WJ, Hahn RT, Lindman BR, McAndrew T, et al. Incidence and sequelae of prosthesis-patient mismatch in transcatheter versus surgical valve replacement in high-risk patients with severe aortic stenosis: A PARTNER trial cohort – A analysis. J Am Coll Cardiol 2014;64:1323-34. Flameng W, Herregods MC, Vercalsteren M, Herijgers P, Bogaerts K, Meuris B, et al. Prosthesis-patient mismatch predicts structural valve degeneration in bioprosthetic heart valves. Circulation 2010;121:2123-9. Moon MR, Pasque MK, Munfakh NA, Melby SJ, Lawton JS, Moazami N, et al. Prosthesis-patient mismatch after aortic valve replacement: Impact of age and body size on late survival. Ann Thorac Surg 2006;81:481-8. Mannacio VA, De Amicis V, Di Tommaso L, Iorio F, Vosa C. Influence of prosthesis-patient mismatch on exercise-induced arrhythmias: A further aspect after aortic valve replacement. J Thorac Cardiovasc Surg 2009;138:632-8. Monin JL. Prosthesis-patient mismatch: Myth or reality? Heart 2009;95:948-52. Blackstone EH, Cosgrove DM, Jamieson WR, Birkmeyer NJ, Lemmer JH Jr., Miller DC, et al. Prosthesis size and long-term survival after aortic valve replacement. J Thorac Cardiovasc Surg 2003;126:783-96. Pibarot P, Dumesnil JG. Hemodynamic and clinical impact of prosthesis-patient mismatch in the aortic valve position and its prevention. J Am Coll Cardiol 2000;36:1131-41. Mohty D, Dumesnil JG, Echahidi N, Mathieu P, Dagenais F, Voisine P, et al. Impact of prosthesis-patient mismatch on long-term survival after aortic valve replacement: Influence of age, obesity, and left ventricular dysfunction. J Am Coll Cardiol 2009;53:39-47. Urso S, Sadaba R, Aldamiz-Echevarria G. Is patient-prosthesis mismatch an independent risk factor for early and mid-term overall mortality in adult patients undergoing aortic valve replacement? Interact Cardiovasc Thorac Surg 2009;9:510-8. Unger P, Magne J, Vanden Eynden F, Plein D, Van Camp G, Pasquet A, et al. Impact of prosthesis-patient mismatch on mitral regurgitation after aortic valve replacement. Heart 2010;96:1627-32. Ruel M, Rubens FD, Masters RG, Pipe AL, Bédard P, Hendry PJ, et al. Late incidence and predictors of persistent or recurrent heart failure in patients with aortic prosthetic valves. J Thorac Cardiovasc Surg 2004;127:149-59.